Explorez le patrimoine local du Passage Intérieur au cours d'une visite guidée de Ketchikan et de ses célèbres totems. 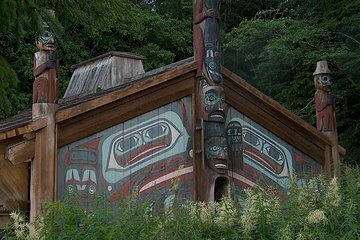 Visitez le parc de Potlatch et celui du parc national Totem Bight State Park, qui abritent ensemble des dizaines de totems peints ainsi que des maisons de clan, des cabines et des canoës récréant un village local traditionnel. Vous découvrirez comment les totems sont sculptés dans un atelier, et vous profiterez d'une visite bonus d'une exposition de voitures anciennes et d'un musée russe qui abrite une rare collection d'armurerie. Although it was a wet day we had the most interesting day with our tour guide who was passionate about his native American peoples' history. Potlatch Park was amazing with great commentary. He went above and beyond to ensure wildlife sightings. We saw whales, bald eagles, kingfishers but sadly no bears. This was an enjoyable excursion learning about history and earlier ways of life. Lots of good scenery and views of salmon and bald eagle. Our family of 9 from 76 years old to 7 years old really enjoyed this trip. We spent the majority of the time in Potlatch Park, however, and I think we needed to split the time more evenly between the two locations. This tour was the worst out of all the tours we had in Alaska. My husband references this tour as the abandoned kids camp. There was no actual native people that we saw throughout the whole tour and it was run down.Don't waste your money. The only highlight was our guide she was very nice. It was interesting and enjoyable. The guide was friendly and helpful. We were the only folks on the tour, so it felt quite special. We had a lot of personal time with him as he talked about the carvings and the history. Walking through the village was at our own pace and we got a lot of pictures.